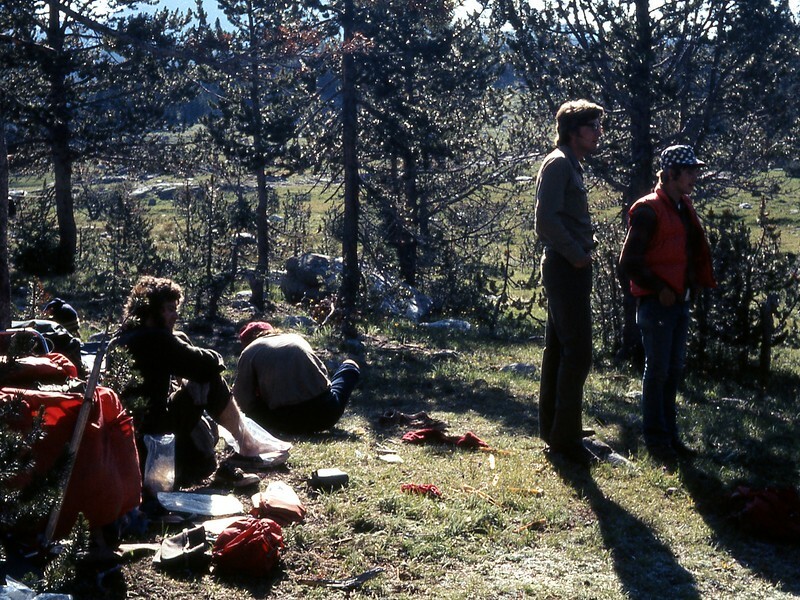 The National Outdoor Leadership School (NOLS) was founded in 1965 by Paul Petzoldt, a legendary mountaineer and fixture in the Teton climbing community. 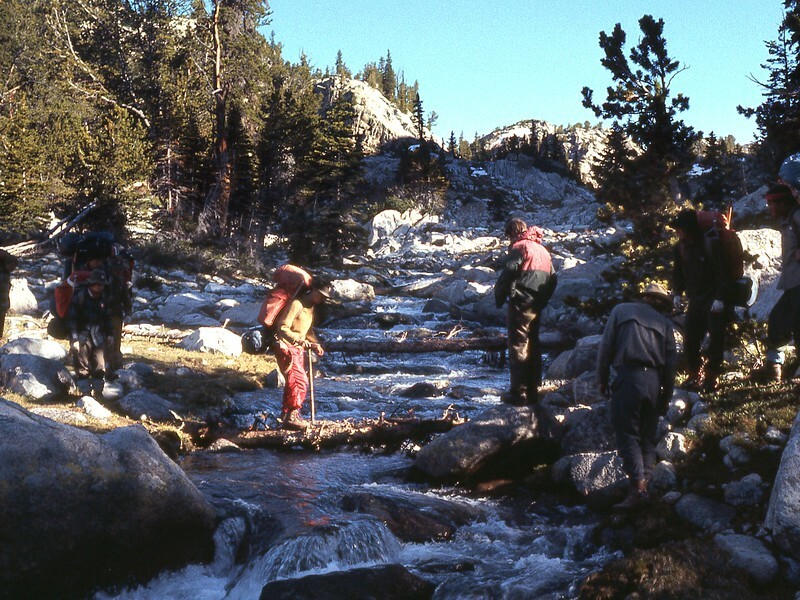 I had completed a basic mountaineering course with the Mazamas in 1972 and was looking for a way to learn more about mountaineering and how to get around in the backcountry. 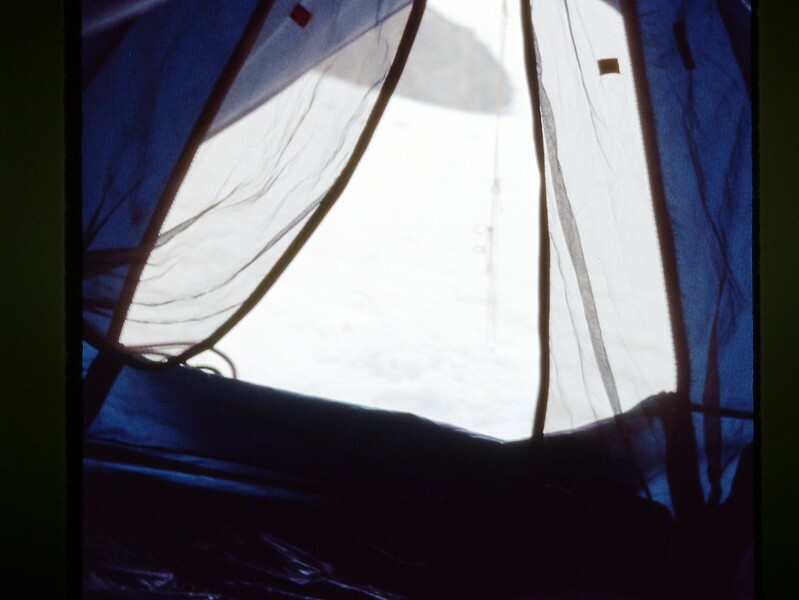 A guy I was rock climbing with at the time (Kim Fadiman) had done a NOLS Mountain Guide course (now it’s called the Wind River Mountaineering Expedition) the year before, was very enthusiastic about it, and convinced me it was just what I needed. 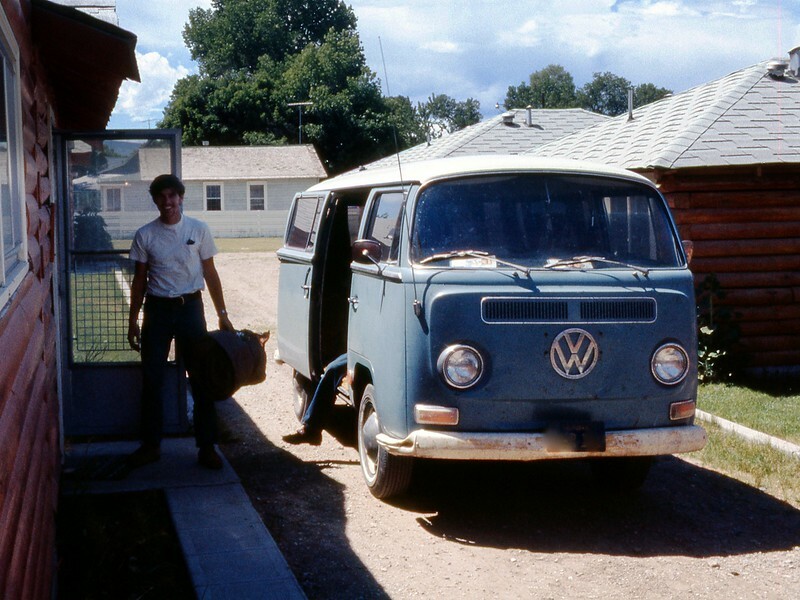 So I signed up and soon found myself at the NOLS “Lumberyard” (whose main building burned down in 1974, taking a lot of gear and supplies with it) in Lander, Wyoming on a nice day in late June of 1973. I recall keeping a journal of this adventure but it seems to have gotten lost somewhere in years past. Fortunately I annotated the 35mm slides I took (with a Kodak automatic camera!) and kept them, so I was able to roughly reconstruct our route from those skimpy notes. 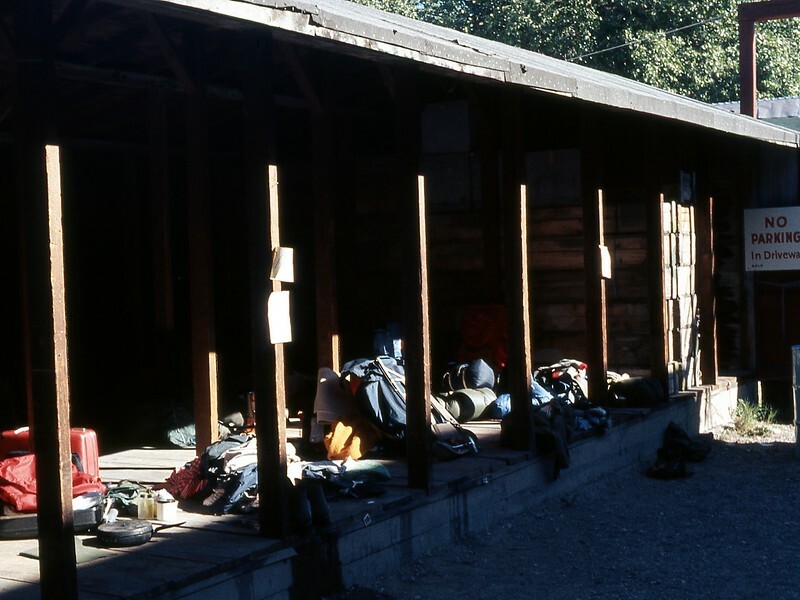 So tottering under our loads, we were bused from Lander to our first camp on the banks of the Big Sandy River on the west side of the Winds, where we started to get to know our course instructors. 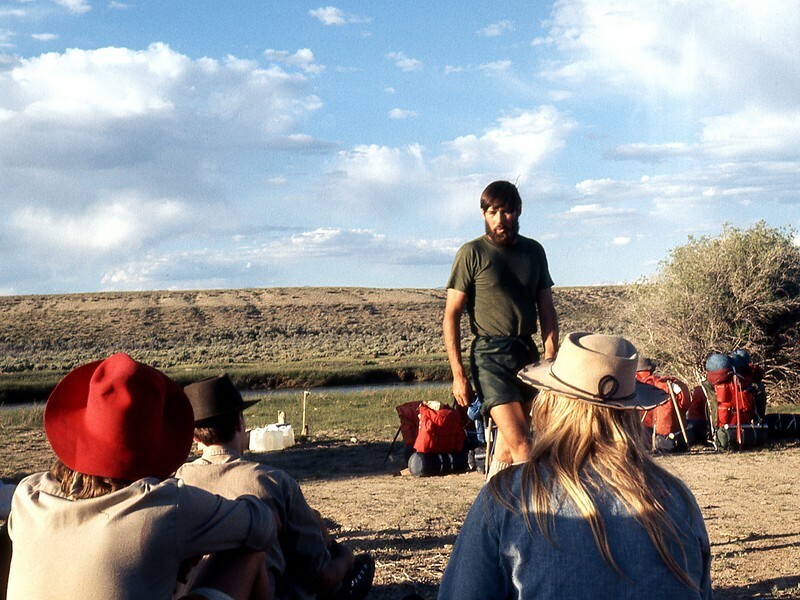 Our lead instructor was Jim Halfpenny, who subsequently went on to become a well-respected author, scientist, and educator, with a special interest in environmental ecology, animal tracking, and carnivores. 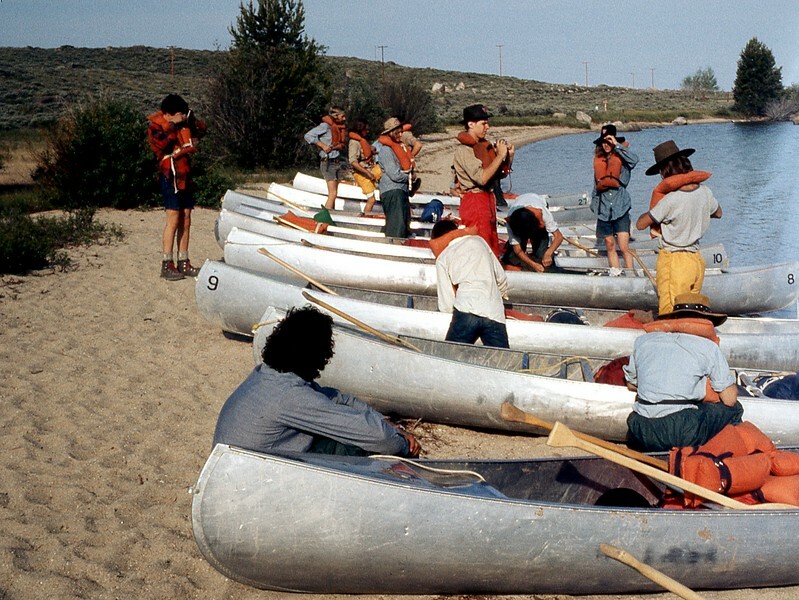 From the Big Sandy, we were bused north to Fremont Lake, where we were introduced to our canoes. 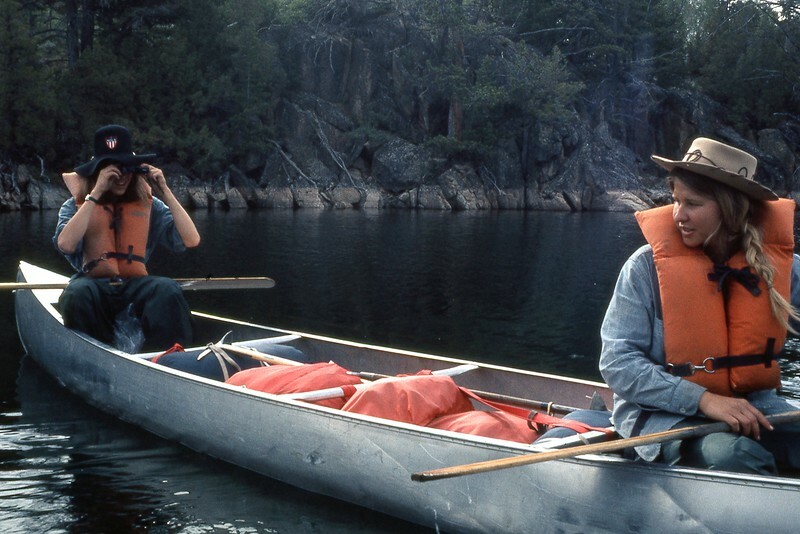 We spent a couple of days on the lake, learning how to paddle and steer a canoe and also how to right one that had overturned. 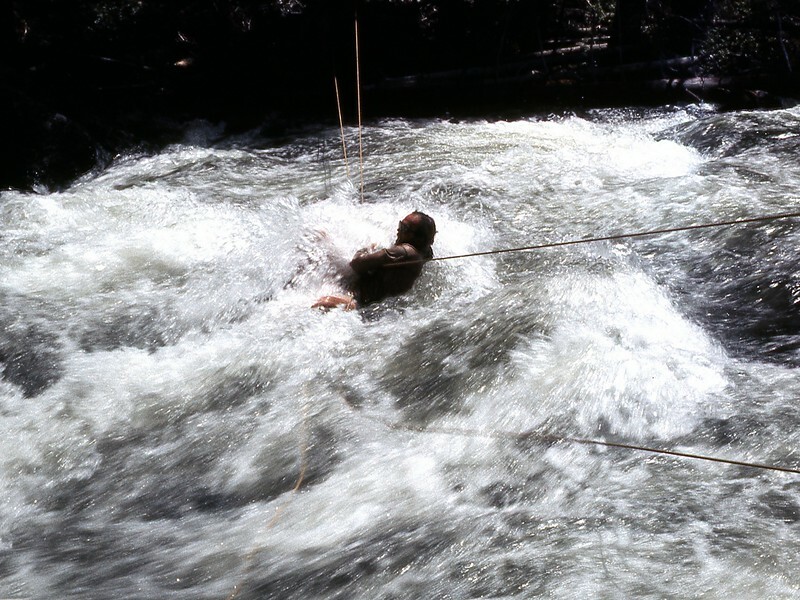 This proved to be a shocking introduction to just how cold waters from the mountains could be. We eventually paddled our way to the north end of the lake where we set up camp and started learning the NOLS way of camping. For example, small cooking fires were acceptable but you had to remove the surface soil first, have the fire, then put the soil (and any turf) back so no fire pit was visible. 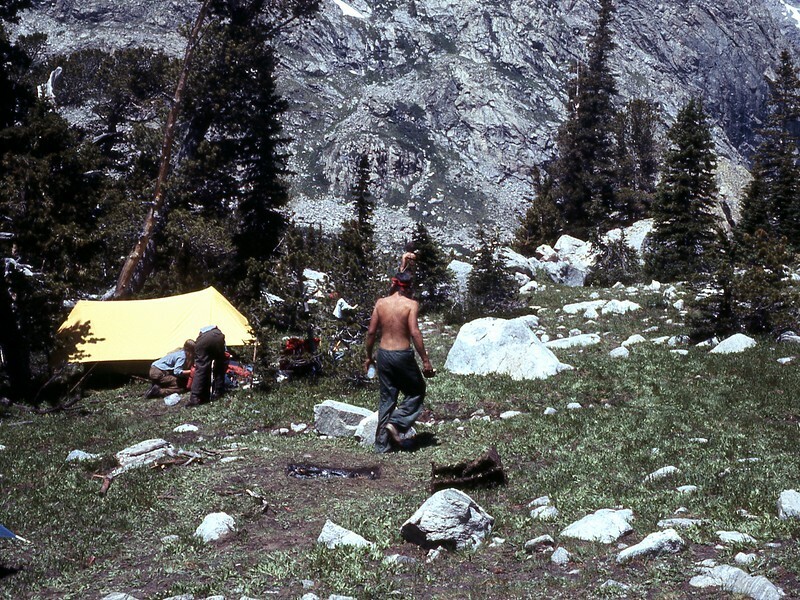 It was the start of the Leave No Trace (LNT) ethic, of which NOLS was one of the pioneers. 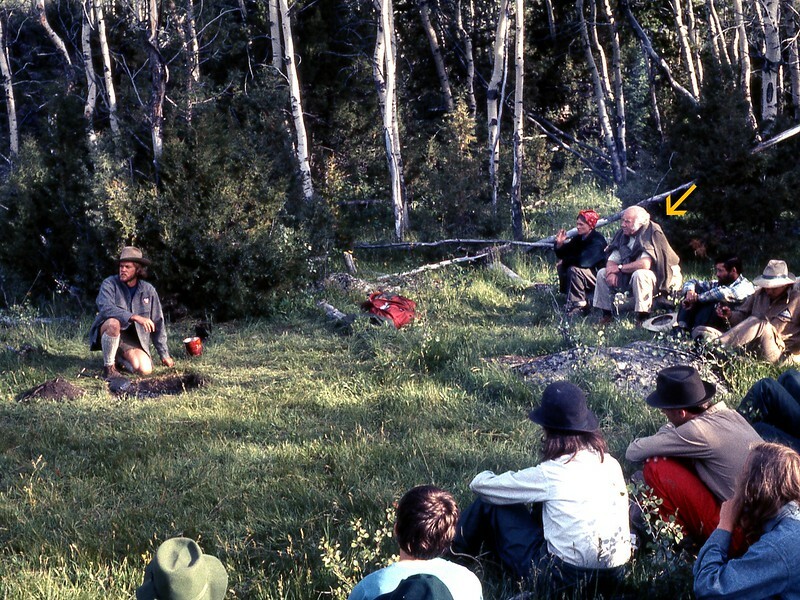 The highlight of this camp (and of the course) was a visit by NOLS founder, Paul Petzoldt (1908-1999). 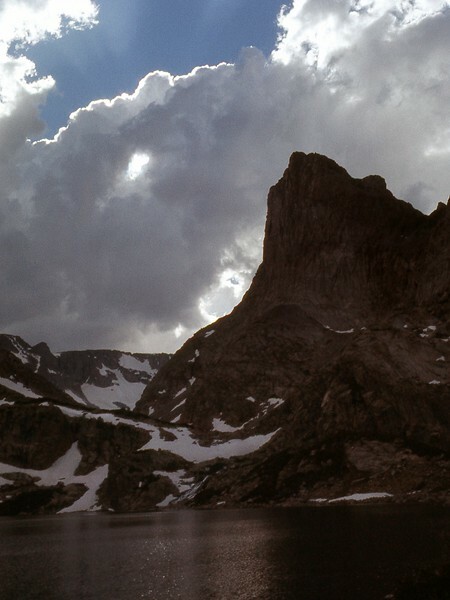 and north to an unnamed lake at the base of Gutierrez Peak (11,363 ft / 3,463 m). 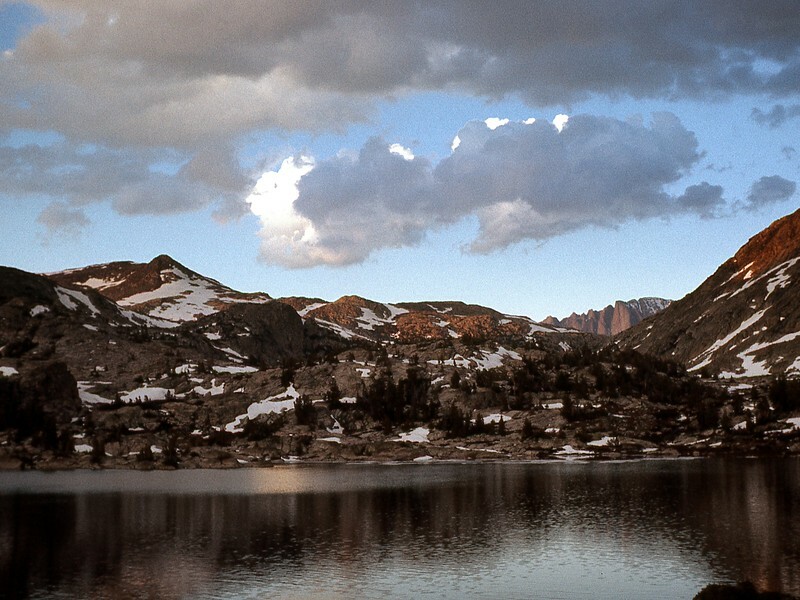 From there we worked our way east to Moya Canyon, past Island and Wall Lakes, and then up to the Continental Divide just east of Lake 10842. 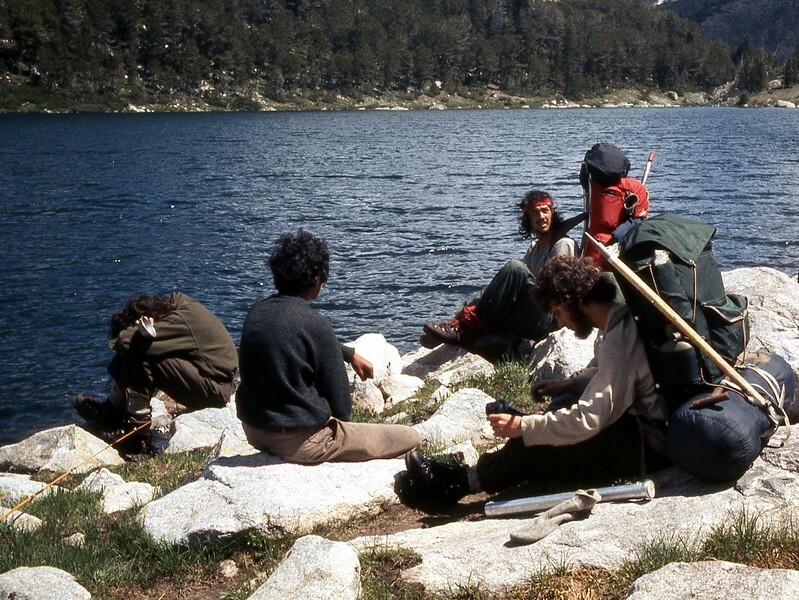 We eventually arrived at Lake 10988 (also called Middle Alpine Lake) at the base of Golden Eagle Pinnacle (about 12,500 ft / 3,800m). Golden Eagle Pinnacle does not appear on current USGS or USFS maps, so I had to turn to my old copy of Bonney’s Field Book to figure out where it is. Issued in 1968, this guide was the latest thing in 1973. Now it’s a bit of a collector’s item (which I, sadly, am not). 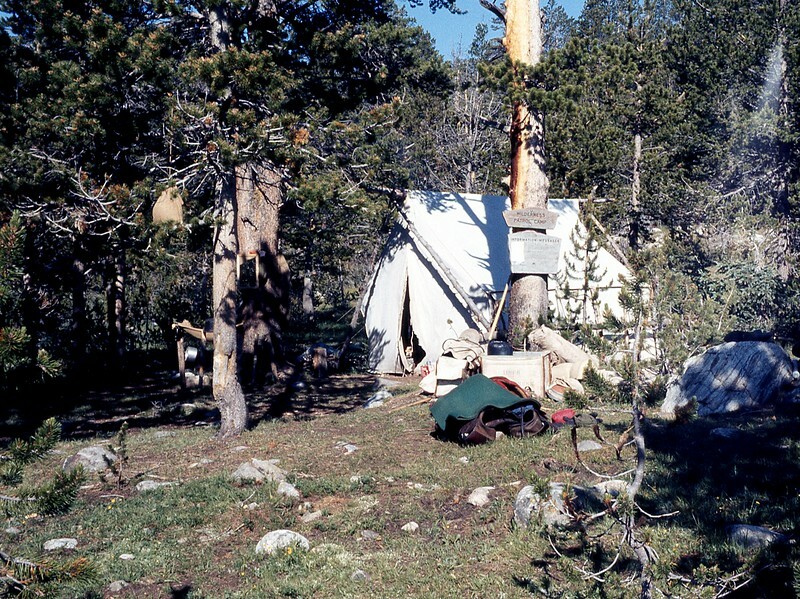 It was at this camp where the accident occurred. One of the students dove into the freezing waters of the lake and the shock he received by doing so managed to massively dislocate his shoulder. It was bad. 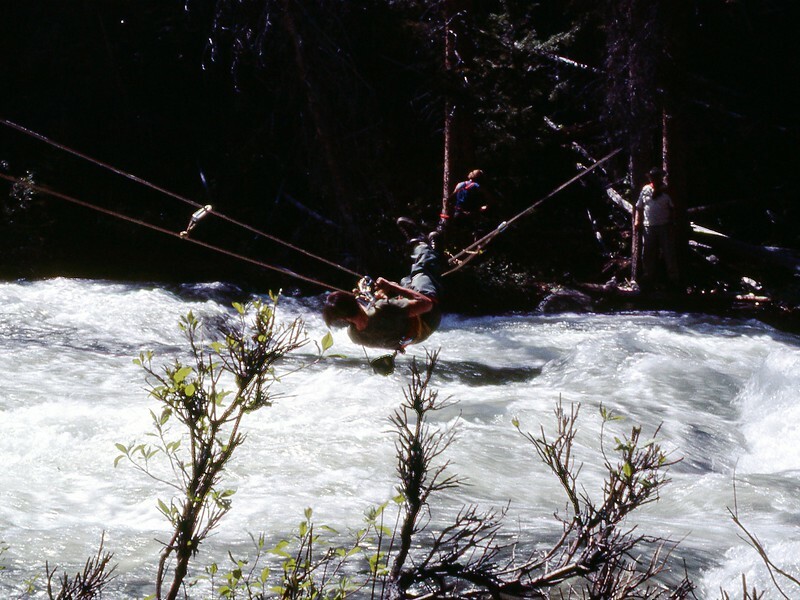 But there were no sat phones or SPOTs in those days to call for help and we were way back of beyond here, in terrain not hospitable to helicopters. The instructors figured it would take as long for someone to go out for help as it would for us to rig stretcher (from small trees) and just carry the guy out. So we did, carrying him, initially cross-country and then on trail, over Angel Pass and out to Elkhart Guard Station. Then we turned around and hiked back to Lake 10988. 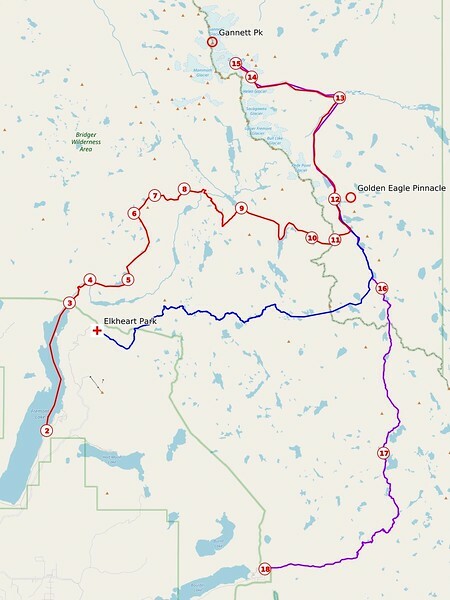 It took three days round-trip to cover this 40 mile route, sleeping on the ground and taking only minimal rations to save weight. And people wonder why I’m always wary of the possibility of an injury in the backcountry. After recovering somewhat from this evacuation drama, we continued north to a camp site known as “Shangri La” (and also not shown as such on any maps) on the North Fork of Bull Lake Creek. 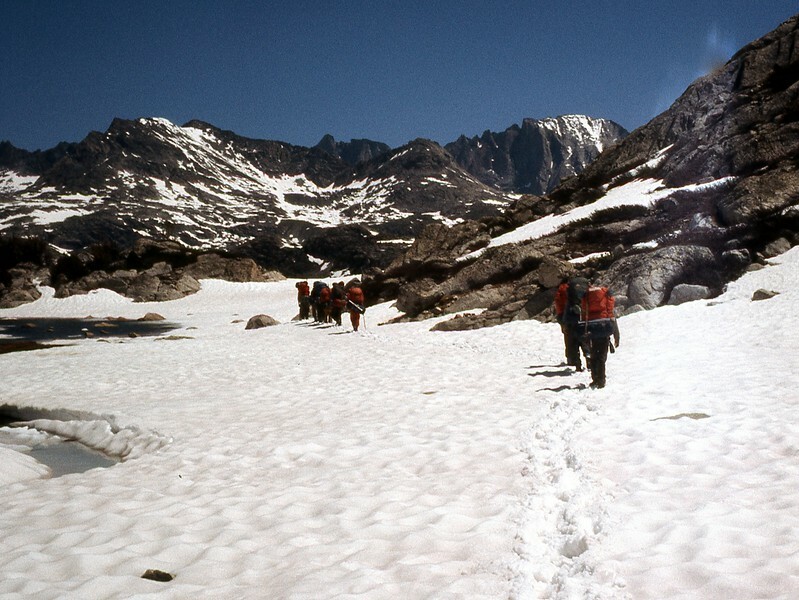 It was a nice place to camp and we spent some time there before pushing on over Elsie Col and down to our farthest north camp on the Dinwoody Glacier, in sight of Gannett Peak. 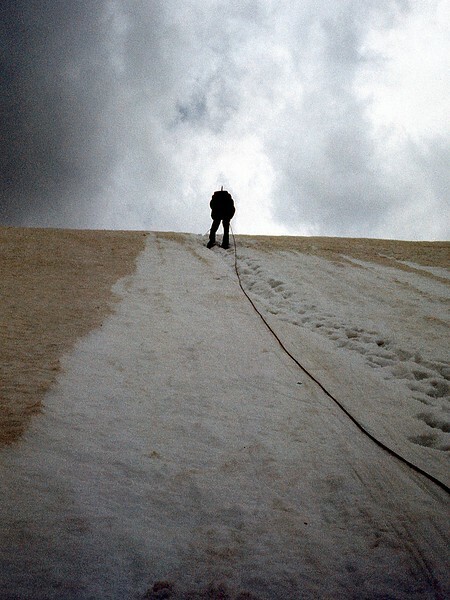 Up to this point, we’d had a little weather – rain & thunderstorms – but nothing that much hindered our progress. But we soon learned that Nature always bats last. 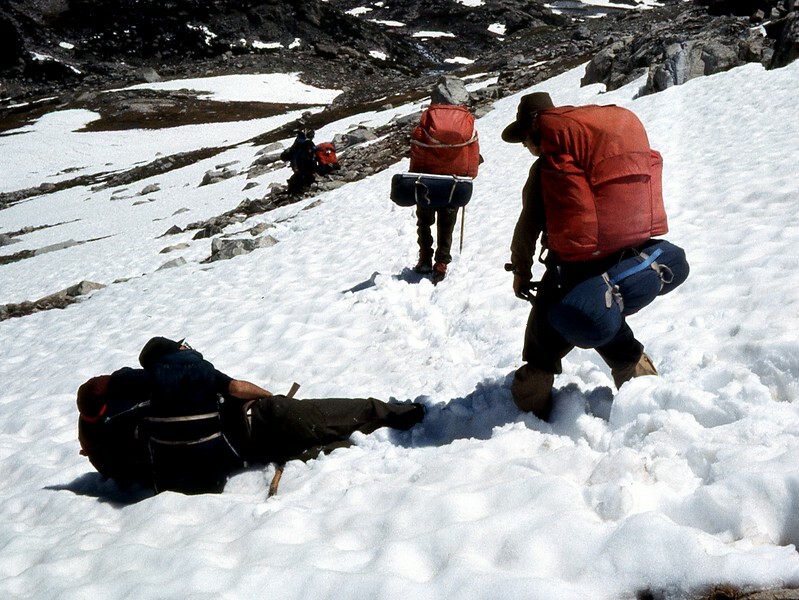 The morning we made our one and only bid for the summit of Gannett, a ferocious snow storm (nay, blizzard) rolled in and we had to call the climb when we reached the Gooseneck Glacier. 😥 It was a huge disappointment after all we’d been through to get here but also a lesson in making coming back alive THE priority. 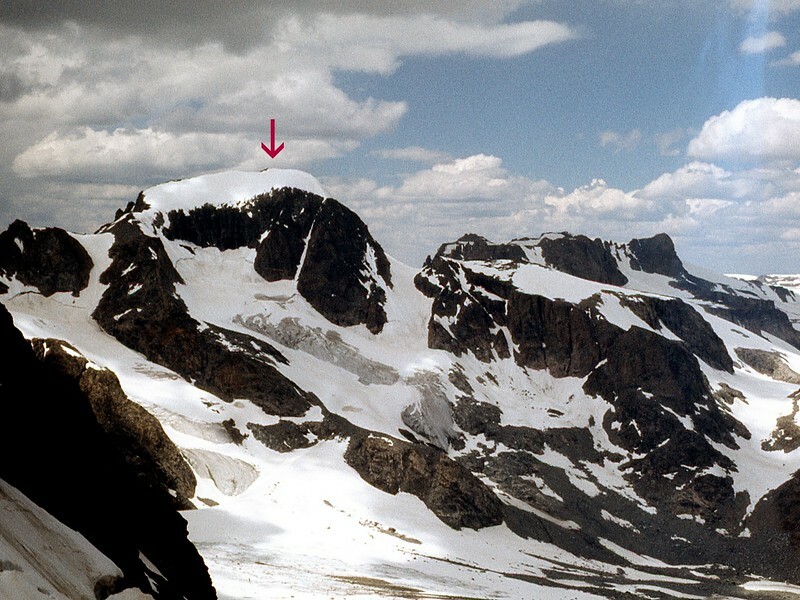 At later (2007) private climb of Gannett was also denied the summit by bad weather. and on to North Fork Lake where we encountered a wilderness patrol ranger. This was a lucky break since one person’s feet had completely given out by this point and the ranger was able to get him out on a horse. 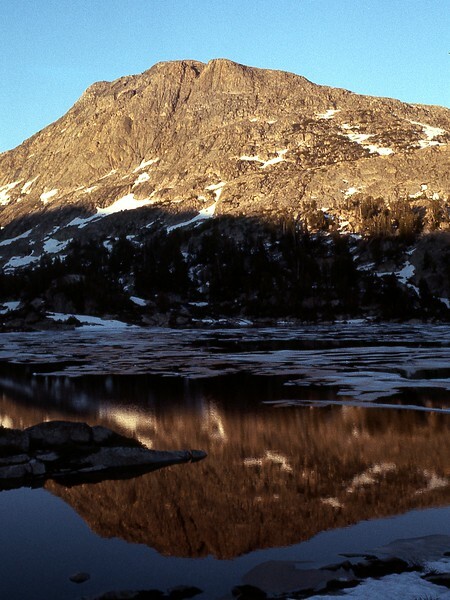 The ranger told us to stay on the trail and it would eventually take us to a trailhead on Boulder Lake. And so, some 40 miles after we’d left the glacier, we stumbled out of the wilderness into a swanky lakeside lodge. 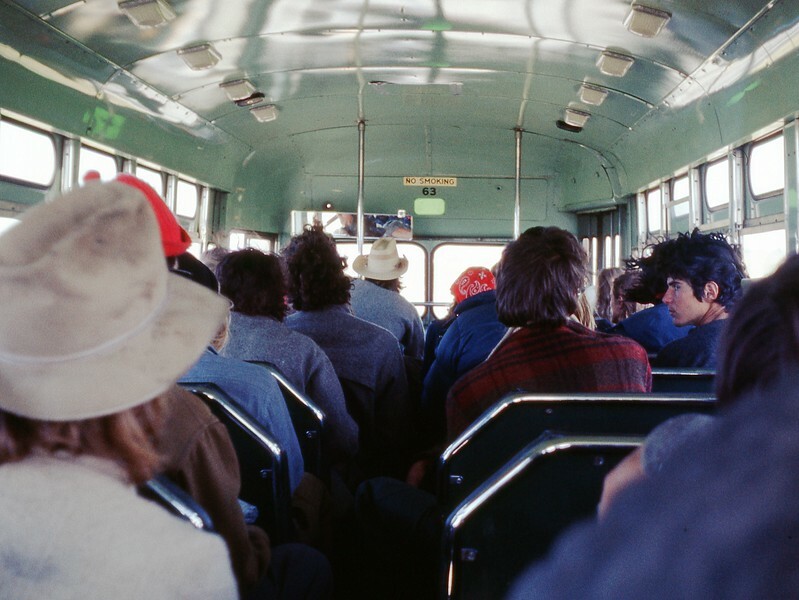 I think we scared them but they still let us call NOLS, who sent a bus to take us back to Lander to get cleaned-up and debriefed. I seem to recall eating a whole box of dry cornflakes on the way back (despite that, and the blocks of lard, I still lost 25 pounds during the course). 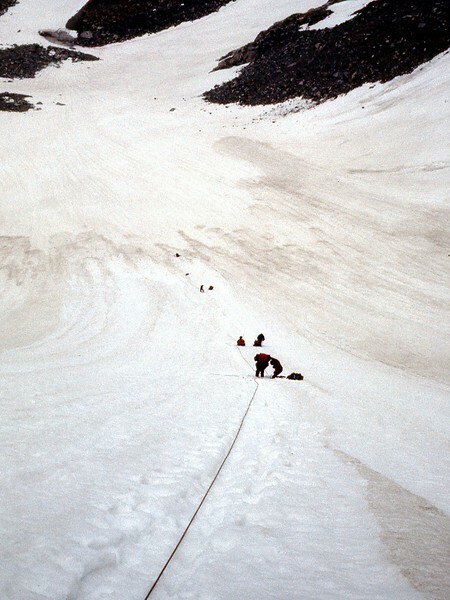 Aside from teaching us, inadvertently, about emergency rescues and what it’s like to be very, very tired and really, really hungry, the course was also supposed to teach us mountaineering and leadership skills. 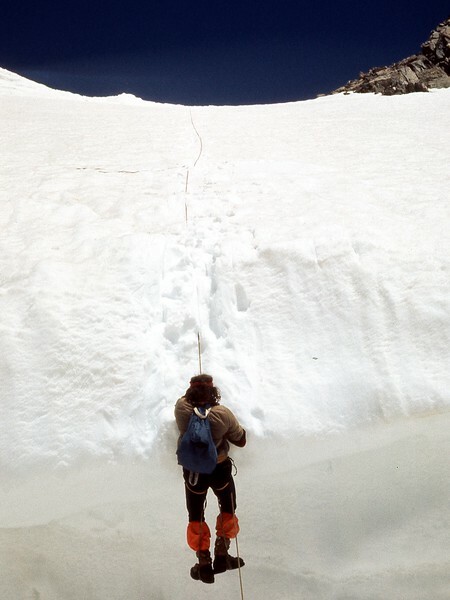 For me, the mountaineering part came easily but I struggled mightily with the more socially-demanding leadership part. But that was on me, not NOLS. If I’d accepted then what this course revealed to me about how I got on (or not) with others in group situations, my future might have been an easier journey. At the time, however, this was a life lesson experienced, but not necessarily learned. I just wasn’t wired that way (and am not to this day). 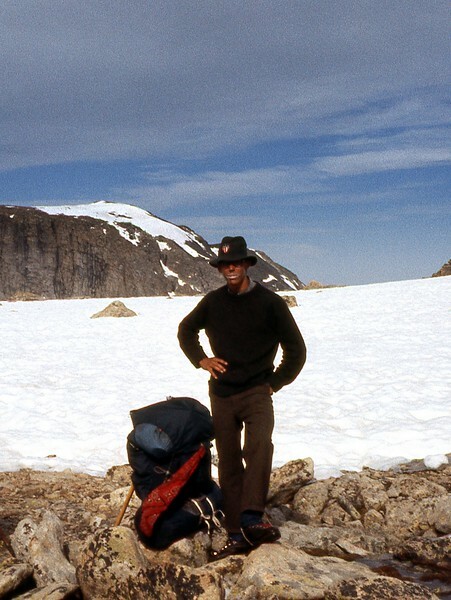 So, instead, I spent years building a small repertoire of social coping skills – enough to allow me to lead private and club mountaineering trips in my own “unique style.” I like to think, however, that the NOLS experience is what guided me, possibly subconsciously, to a career in science, where socially inept geekiness proved more acceptable (and now, thanks to Big Bang Theory, may even be temporarily fashionable 😉 ). awesome. That story would have like 12 lawsuits today! As I was recollecting this trip with 40+ years of hindsight, yes, there were some cringe-worthy moments. But that was a less risk-averse time. 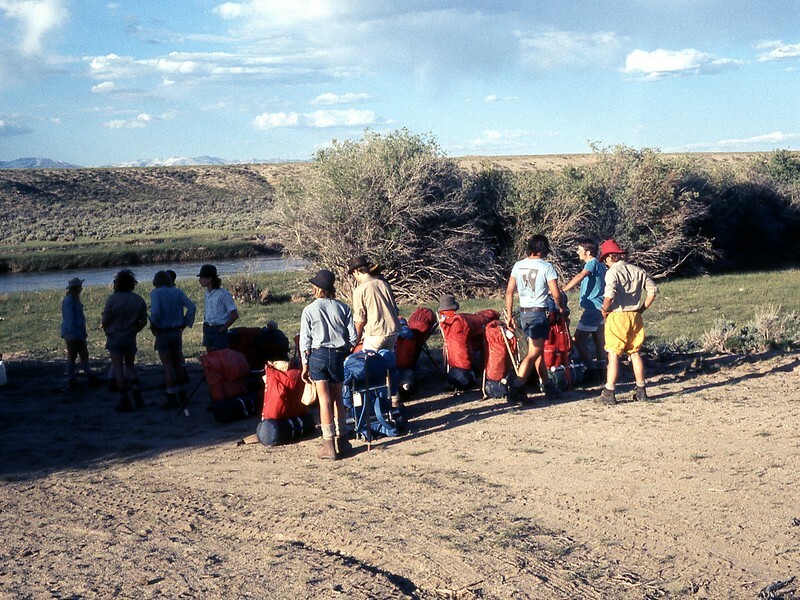 I’m guessing today that these expeditions are conducted differently (for example, the leaders leaving the students at the end was abolished in 1992). 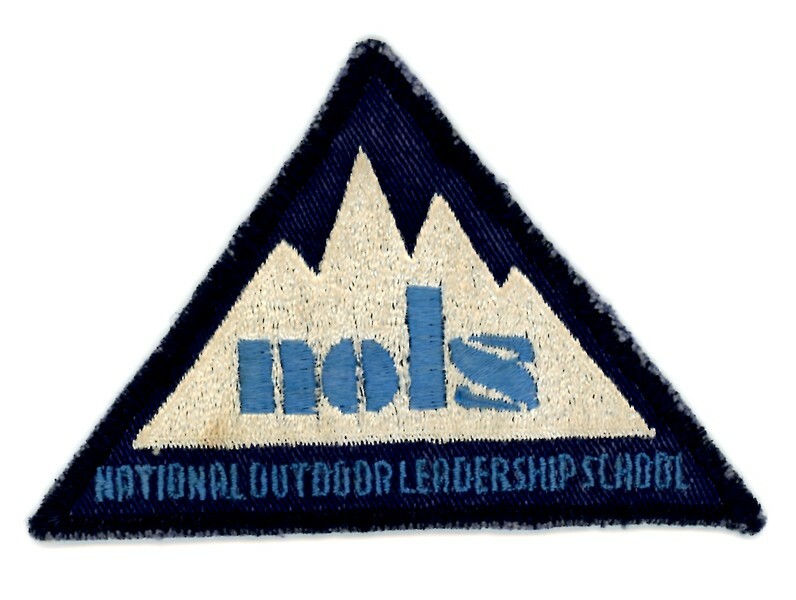 Overall, NOLS has a good safety record and has become one of the leaders in the assessment and mitigation of risk associated with outdoor activities. Ninety pounds!!?!! Ah, to be young and crazy again–well, maybe not! How heavy were the women’s packs? Really enjoyed this write-up and pictures because I’ve only heard bits and pieces of this trip. Thanks – I’m getting a lot of use out of the slide scanner! 1973? Young & clueless was more like it. 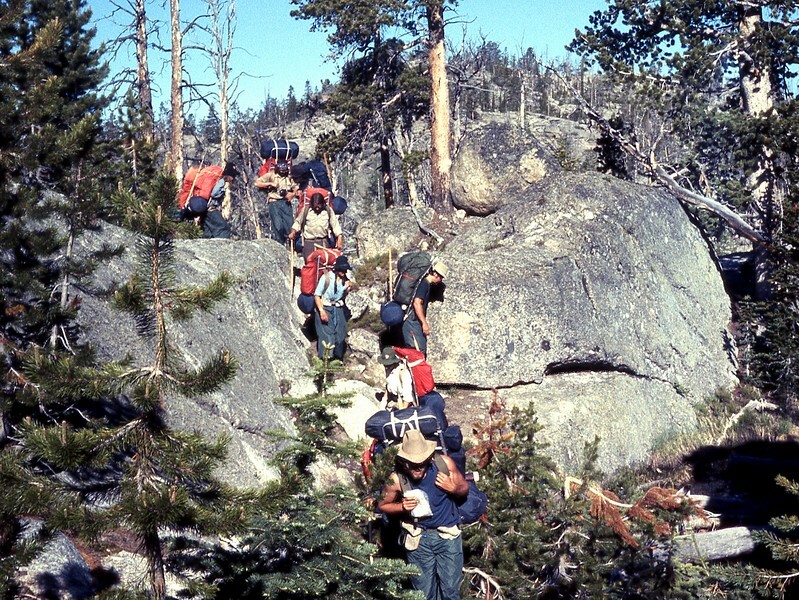 As I recall, there was no differentiation on this course – the men and women carried packs of similar weight and participated equally in every activity.